The internet has emerged as the leading source of prospective tenants for our properties. People prefer the ease with which they can review numerous properties in a short period of time. Louise Beck Properties, Inc. has worked diligently to ensure our web presence is the most comprehensive and aggressive in the area. With our best-in-class searchable website and our inclusion in a myriad of local and national websites we reach more prospective renters than any other company in the area. When prospective renters review our listings, they enjoy interior and exterior pictures as well as a comprehensive description of your property. Sounds obvious, but most of our competitors don’t do it, and those that do, don’t do it as well! The Triangle Multiple Listings Service is available to and accessible by licensed Realtors in the Triangle area. This comprehensive database includes extensive information and photographs of properties and land, both commercial and residential, available for sale. Rental properties are also accessible on the TMLS system; however, few Realtors and rental companies take advantage of this opportunity to market their rental listings to Real Estate Agents, many of whom are working with buyers who need a place to live while they search for a permanent home or have a home built. Louise Beck Properties averages over one third of the total rental listings available on the TMLS system in the area we cover. Unlike many Realtors and property management companies, our TMLS entries always include at least an exterior photo (if the unit is currently occupied), and extensive interior photos if the unit is vacant. 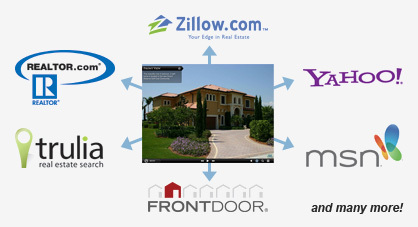 Through the MLS system, other real estate companies and individual agents include our listings on their sites. 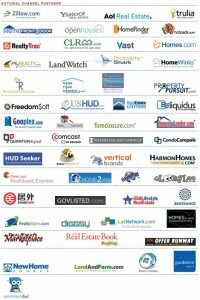 Most companies provide searching MLS listings through their webpage. Therefore, the number of websites with Louise Beck Properties’ listings number in the hundreds, giving your property additional exposure to potential renters worldwide. Through CSS Showings, a value-added feature of TMLS, showings are coordinated electronically, allowing qualified Real Estate agents to show your property any time of the day or night that is convenient for prospective tenants, increasing the opportunities for the property to be seen and rented. Triangle MLS partnered with a national listing service, ListHub. “ListHub is the broadest, most widely adopted network for listing distribution, and works in concert with MLSs, franchises, and core real estate technologies. ListHub brings a comprehensive system for maximizing listing exposure.” Through this powerful service, your property listing will be available on the internet’s most widely used housing search sites. 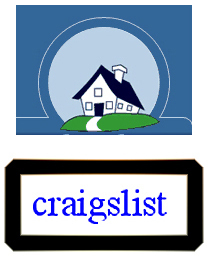 Craigslist is a free website where people all over the world gather to trade information on available housing, employment, merchandise, etc. We regularly post our listings to the Raleigh section of Craigslist, and have experienced excellent results. Our custom designed postings enhance your property listing. 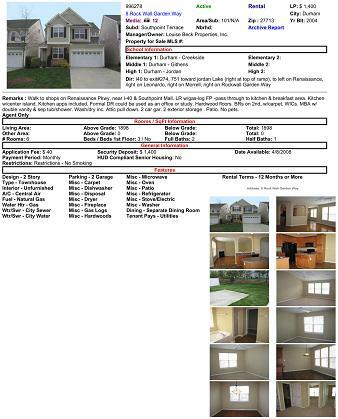 These comprehensive listings stand out from the typical Craigslist post. A Virtual Tour can also enhance the exposure of your home. This tour is linked to a variety of websites including your MLS listing, Realtor.com and the listing on louisebeckproperties.com. We can link the tour to additional major portals and Real Estate sites that allow them to show the tour with your listings. They are constantly adding new automated distribution partners so your tour will be visible in as many places as possible. WCHLWCHL is Chapel Hill’s oldest continuous broadcaster with programming designed to cater to the area’s unique needs and desires. This highly community-oriented station boasts a loyal following. Programming is geared towards the Chapel Hill/Carrboro community, with a focus on local news and community affairs programming. WCHL is the flagship station for the Tar Heel Sports Network. Originally an AM station, WCHL now broadcasts on both AM and FM radio. The Chapel Hill-Carrboro Chamber of Commerce visitors and relocation packages include the relocation guide and map of the area. Both of these popular informational tools are distributed widely through out the area and via mailings. The guide is produced in collaboration with the Chapel Hill Magazine. This guide is aggressively distributed through all Chamber Relocation requests, through Realtor and bank relocation packages, at hotel rooms, UNC Parent’s Weekend and Orientation Weekends, on newsstands, the RDU airport and NC Welcome Centers, through employment relocation packages, and much more. The map, produced by the chamber is distributed to over 10,000 people/businesses throughout the year. In addition, Louise Beck Properties flyers are displayed at the Chamber, available to all walk-in traffic. The Daily Tar Heel is the University of North Carolina at Chapel Hill’s student newspaper. It has been published daily (Monday through Friday) since 1929. Today, the publication reaches approximately 35,500 readers. With 215 distribution locations throughout the UNC campus, as well as in Orange and Durham Counties, the newspaper estimates that 90% of the campus community read the paper. Louise Beck Properties maintains a regular advertising presence in this publication, purchasing large ads in special housing issues and theme publications. The Duke Chronicle is Duke University’s daily newspaper. Housing issues are published several times a year when students and faculty are relocating and looking for housing. Louise Beck Properties’ ad prominently features the website, and additional exposure for your property. This publication reaches 20,000+ Duke employees including 2,500+ regular faculty,1,500 senior physicians, 800 residents and fellows. The 13,500 Duke students receive the paper, including 6,800 graduate and professional students in the Graduate School, Fuqua School of Business and the schools of law, medicine, divinity, environment, engineering, physical therapy and nursing. The housing guide is also distributed to graduate and professional schools to be given to incoming students. In addition the paper is mailed to the homes of all new and returning Duke undergraduates. Through a local poster distribution service, Louise Beck Properties, Inc. sends 100 flyers to be posted around the Chapel Hill and UNC areas each month. The flyers highlight only a few properties to keep visibility clear and easy, but prominently display our website and contact information, enticing the reader to log on and see all of our listings. Tabs with our contact information can be easily removed from each flyer, making it easy to take our information home. 100 locations receive the flyers, including; the public bulletin boards at UNC campus, hospital and medical center, the poster kiosks on Franklin and Rosemary Streets, the Chapel Hill Post Office, any shops, restaurants and cafes with bulletin boards, Carrboro, Weaver Street Market, Farmers Market, Elmo’s, Art Center, Cat’s Cradle, Whole Foods, Weaver St Market in Southern Village, Chapel Hill Public Library, Senior Center and many other places. Our signs are highly visible throughout the local area and immediately recognized as a symbol of professional and quality management. Whenever possible, all other advertising reinforces the power of our signs by incorporating our logo. Our website is listed on our signs, directing prospective tenants to photos of and information about your home that is available 24 hours a day, 7 days a week. Tastefully designed and carefully maintained, these signs are more acceptable to neighbors than cheaper, flimsy hardware-store “For Rent” signs. 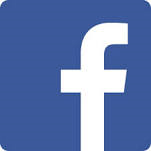 FacebookLouise Beck Properties targets specific markets through our Facebook campaign. Facebook ads include incentive programs targeted at the student demographic throughout the student rental season. Louise Beck Properties, Inc. ensures we have a presence at UNC Housing Fairs. These fairs are visited by hundreds of students and prominently feature our student rentals. We hand deliver information on available properties to the Student Services Departments of the professional schools on the UNC campus. Student Services Departments then pass along this information in packets directed at incoming graduate and professional students. We also sponsor continuing education classes for area Realtors. Sponsoring these classes cements our image as the area’s leading property management company. When agents help their clients find a rental property, they think of LBP.